When it comes to flyer printing in Trenton you can trust our experts. Printed flyers can help boost your marketing ROI and create awareness about your cause or business. We print full-color or black-and-white flyers in all shapes and sizes, so before you put your message in the hands of your audience, let us create a quality printed flyer that will get the results you deserve. 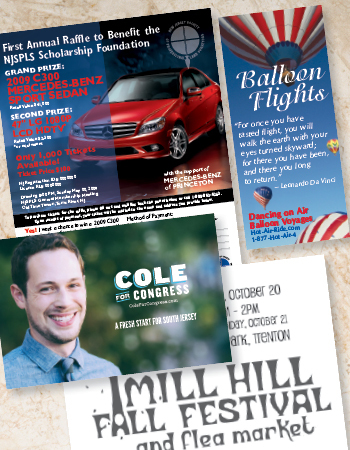 Trenton Printing can design and print the perfect custom flyers for your organization; see for yourself: Advertising Flyers, Business Flyers, Church Flyers, Concert Flyers, Die-Cut Flyers, Event Flyers, Full-Page Flyers, Non-Profit Flyers, Political Flyers, Promotional Flyers and Wedding Flyers. Want your printed flyer to entice, but don’t want to give away all the info upfront? Trenton Printing can create a custom brochure that can hold much more content than a flyer.